Kermit the Frog sang about how it's not easy being green. Apparently it's not easy being furry and red, either. 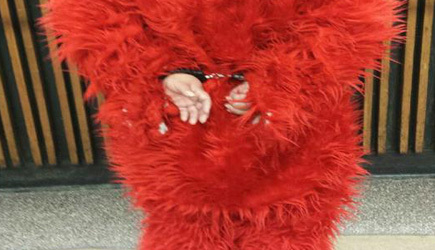 Rosa Sanchez, dressed as the Sesame Street character Elmo, was allegedly arrested for "aggressive solicitation," according to the New York Post. The arrest was reportedly the result of a sting operation involving ten plainclothes police officers posing as tourists, all of whom took pictures with her. Sanchez supposedly became "aggressive" over the size of a tip she received. Police allegedly found that she had $200 on her in ones, fives, and twenties. Police posted a picture on Twitter of Sanchez from the back with handcuffs. The post read, "Just another day in Midtown South. Elmo arrested in Times Square". Costumed panhandlers looking to be paid for allow people to take pictures with them have seemed to become an increasing problem in the Times Square region of midtown Manhattan. The busy tourist mecca is a popular destination for dining, theater, and other entertainment. But the carnival atmosphere with people dressed as characters from animated and live action movies and television has become punctuated by discord. Earlier this week, for example, two men dressed respectively as Batman and Spiderman allegedly attacked a heckler and were arrested, according to WNBC-TV. Other characters who have found themselves as temporary guests of the police just in September have been Woody from Toy Story, Minnie Mouse, and the Statue of Liberty. They allegedly had posed with a family to take pictures and then demanded $5 each, which the family had refused to pay. Concern over costumed people began to escalate when someone dressed as Spiderman allegedly punched a police officer in July, according to the New York Post. "Super Mario groped the woman," says Times Square Alliance president Tim Tompkins. "Elmo was ranting anti-Semitic things. Spider-Man punched a woman in the face. Now a kid was attacked by Cookie Monster. And those are just ones where there's been an arrest! We've anecdotally heard there's a lot more that's been happening. One of my staff members said an Elmo patted her backside when she was walking through Times Square on a crowded day." The costumed buskers have publicly argued in a press conference that they should be able to make a living, according to WNBC. And, then again, as the New York Daily News notes, things could be worse, as they were in the 1980s when "Times Square was a parade of junkies, prostitutes, pimps and tough nuts who looked like they just got out of jail or would soon be in one." Perhaps the Justice League of America can swoop in and restore order.